The Baal Shem Tov… we think. It appears that it is actually a different guy: Rabbi Falk, the Baal Shem of London. 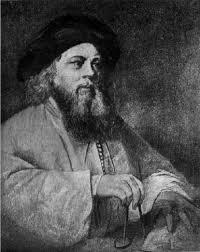 Hasidism emphasizes the negation of the material world. Hasidism was a messianic movement. Hasidism regarded prayer as “higher” than study. Hasidism considered prayer and study as equally holy. Christians considered the tombs of tzaddikim as sites of veneration and visited them. The Shivhei ha-Besht (In Praise of the Baal Shem Tov) recycles stories from the Shivhei ha’Ari. The Besht (Baal Shem Tov)…. a. was an unschooled radical who opposed the social structure of his time. b. was a paid functionary with a plum residential post. c. intended to found a movement. d. became popular because he offered comfort to a traumatized people. a. paid no taxes; he was granted a domicile and supported by the local religious b. establishment. c. was a rebel against the religious perspectives that surrounded him. d. was a true “man of the people”. a. because the Besht and his followers worked consciously to create one, spreading out across Poland, Lithuania, Galicia, etc..
b. composed of poor and unlettered Jews. c. in part as a result of the opposition of Jewish Enlightenment thinkers. This semester, my ALEPH seminary students are answering these kinds of questions in our course on the history of Hasidism. We are busy dissolving a good bit of mythology, working instead with the messy reconstructions of history. No, the Baal Shem Tov had no idea and no intention of founding a movement. He worked as a local practical kabbalist and hung out with other scholarly and semi-scholarly men who were interested in Kabbalah. The men he fraternized with were, in large part, exploring mystical ideas we can trace to mystics of 16th century Safed and the early pietistic elite who succeeded them. No, the Besht was hardly revolutionary or engaged in a battle with “establishment religion.” His sources of learning were also theirs. Many scholarly Jews studied Kabbalah – including the Vilna Gaon who so opposed the Hasidim. Rabbinic leaders across Eastern Europe were sympathetic with Hasidic pietists who preceded the Besht, men whose ideas and practices he often borrowed. The Besht was a faith healer, hired as such by the religious establishment in Meshbizh. He was given a house (#93) to live in and, as a paid functionary, he didn’t have to pay taxes. It is likely that his work included the writing of amulets (a longstanding part of Jewish practice that dates back to Second Temple times), incantations (also an established practice), and conducting exorcisms (ditto). In some respects, finding the Besht is a little like looking for the historical Jesus. The Besht did not leave treatises or books for us to ponder. His letters have been redacted and “produced” by later followers. Te stories we read in the Shivhei ha-Besht are part of a well-known genre of hagiography, one particularly popular in Christian circles and adopted in Jewish ones. Hagiographies originated as accounts of saints or ecclesiastic leaders, accounts that were, by the nature of the writing, packed with holy deeds and miracles. Jews adopted the genre and populated their pages with figures like the Ari and, later, the Baal Shem Tov. Christianity had its saints; Judaism had its tzadikim. Hagiography is history. The former is about building legends. The latter is about dissolving them. Are we, then, to discard such legends and myths? Should the “real” history, such as we know it, lead us to dismiss the hagiographies we are heir to? The beauty of the stories we read is that their beauty never fails to move us, after all. That’s why they were written; that’s why we read them. But we learn history for good reason, too. It is important to place the Besht in his own time – as far as we are able. History is a messy, complicated thing. Discovering how those opposed to Hasidism actually played helped (re)create it as a “movement” helps us understand where, how, and why Hasidism spread in the first place. Knowing how rooted in tradition Beshtian Hasidism was can illuminate a great deal about Hasidic community in our own time. And this, too, is important. If the Besht is not who his followers made him out to be, what is it that they needed him to be, and why? That is, in a real sense, a spiritual question as well as a historical one. Just as importantly: Who do we need the Besht to be, and why?